What is an Ion Cleanse Foot Spa and How Does it Work? The Lenson Ion Cleanse Foot Spa uses electrolysis/osmosis to draw toxins out of the body through the 2000+ sweat glands in the feet. This method is proven to be very effective in pulling toxins from all parts of the body. The Ion Cleanse Spa is designed to help alleviate the core causes of diseases by removing metal toxicity and internal pollutants and balancing the body’s pH. Any substance that is harmful to the cells of the body, tissue and organs are considered toxins. Toxins mainly consist of metals, chemicals, bacteria, excess proteins and waste that is not expelled from the body. How Do I Know if there are Toxins Present in my Body? The following environments and conditions may help create and may indicate high toxicity levels. Live near a major road, highway or in a city? Eat sugar, chocolate and sweet bakery treats? Eat non-organic fruits, vegetables and meats? Do you have poor circulation – cold hands/feet? Do you operate electrical or electronic equipment? Do you find it difficult to wake up in the morning? Suffer from depression, confusion or forgetfulness? Do you have to urinate often during the night? Suffer from sneezing, runny nose, hay fever or sinusitis? Suffer from headaches, migraines and sore and achy muscles? Live in a renovated or new home? Suffer from premenstrual symptoms, breast or uterine cysts? Suffer from insomnia, walking in the night, or disturbed sleep? Drink alcohol, coffee or tea? Use bleach, detergents, household cleaners and disinfectants? Are you often irritable, impatient, tense or agitated? The more times you said yes, the more toxic your body is likely to be. Your body is working overtime trying to eliminate these harmful toxins. As the body continues to accumulate toxins, they begin to circulate deeper into the body, causing further congestion and complications. The energy the body normally uses for healing and growth gets redirected, trying to neutralize the toxins circulating in your system. Why Does the Water Become Discolored, Even if the Feet Are Not Immersed in the Unit? The unit is controlled by a micro computer chip system, when the two electrolysis plates of the unit oscillate; countless number of ions is created. Tap water, salt and the steel plate all contain a number of minerals and substances, and accordingly, will produce a chemical reaction and change the colour of the water. What Do You Feel When Using the Spa? Some users claim that they don’t feel anything and some describe a tingling sensation. This may be due to sensitive skin, strong conductivity, because the users have not removed metallic objects from their bodies, such as jewelry, or they may be in contact with a metal chair/object. It is not suitable for everyone, if you have the following conditions; we recommend that you do not use the ion spa. If you have any other concerns regarding the use of the spa for health reasons, we recommend that you consult your doctor. Wearing pulse adjuster, pace maker, metal or other electromagnetism devices. People who have undergone heart transplantation. People who periodically taken medical or psychological therapy. People with open wounds on their feet (may soak hands instead). Water and exercise are crucial to help keep the body functioning properly. This allows the body to circulate the blood and lymph system and is vital in assisting the body to purge the toxins out of the cells and bring the good nutrients to the cells. Drinking a minimum of eight cups of natural spring water, eating organic vegetables and fruit, and having multi-vitamins each day plays a critical role in any detoxification program. Studies, trough the use of urine tests, have shown that after several treatments, clients had a reduction of nearly fifty percent in both lead and mercury levels. By testing the spa water before and after a thirty minute treatment, results have shown toxins such as arsenic, lead and nickel in the water after use. 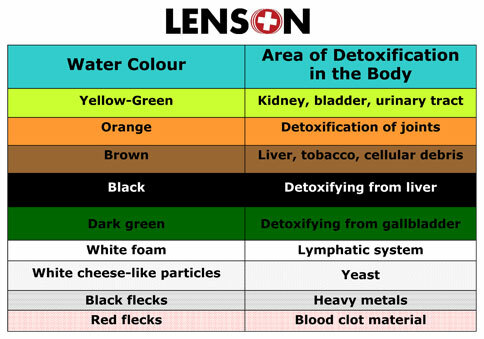 These toxins were pulled directly from the body. Measuring blood pH is another way to test the effectiveness of the ion cleanse spa. A few ion cleanse treatments can help raise the pH levels from acidic to alkaline, helping to defend the body from viruses/bacteria/disease. If you are interested in learning more about the ion cleanse foot spa, contact us.